There was a famine in the land and Isaac move to Gerar. The Lord said to Isaac, “Don’t go to Egypt. Stay here and I will bless you and be with you.” So Isaac obeyed the Lord and stay in Gerar. Some men asked Isaac about Rebecca, “Who is she?” and Isaac replied, “She is my sister.” Isaac said this because he was afraid they will kill him in order to have Rebecca. One day, King Abimelech saw Isaac kissing Rebecca from the window. Abimelech was very angry about it and command that no one should touch Rebecca or he will be put to death. Isaac sowed in the land that same year. The Lord blessed Isaac and Isaac reaped 1000 folds. Because of God’s blessing upon Isaac, Isaac became more and more prosperous until he have herds of livestock and servants. 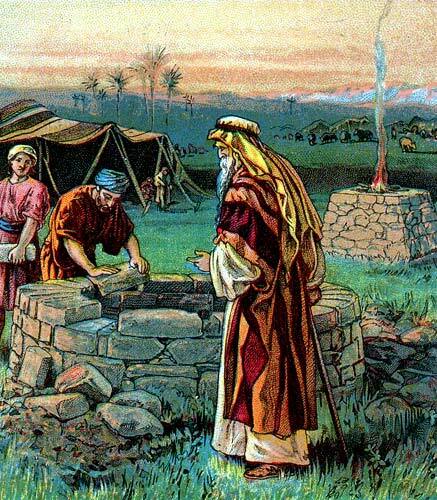 The Philistines grew jealous of Isaac and stopped up all the wells that Isaac’s servant dug. Abimelech told Isaac to go away because Isaac has become wealthy and powerful. So Isaac moved away from there and pitches his tent in the valley of Gerar. One day, Abimelech, his friend, Ahuzzah and army commander, Phicol paid a visit to Isaac. They wanted to make a treaty with Isaac so that Isaac and his men will never harm them and they will do the same in return. So Isaac held a feast. They ate and drank and Isaac sent them away in the morning.